Happy Good Friday everyone! Do you have today off? 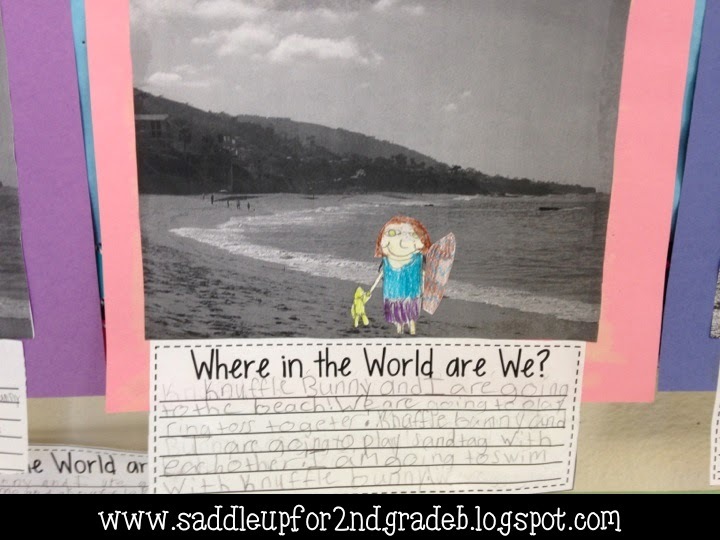 It was so nice to sleep in this morning but I could not wait to share what we did in Reading this week. Every once in a while I like to venture outside of our Journey’s series and share some of my very favorite stories with my kiddos. We had a short week this week and I knew it was the perfect time to bring the Knuffle Bunny out of my filing cabinet. These are my very favorite children’s stories so they don’t get placed in my library. They are nicely filed away in my cabinet so they don’t get torn up. I had the chance to meet Mo Willems while I was in college. He presented at the Children’s Literacy event held at Texas Tech and I immediately fell in love with his work. His stories are beautifully written with humor and my kids adored his illustrations which is what I really tried to focus on this week. 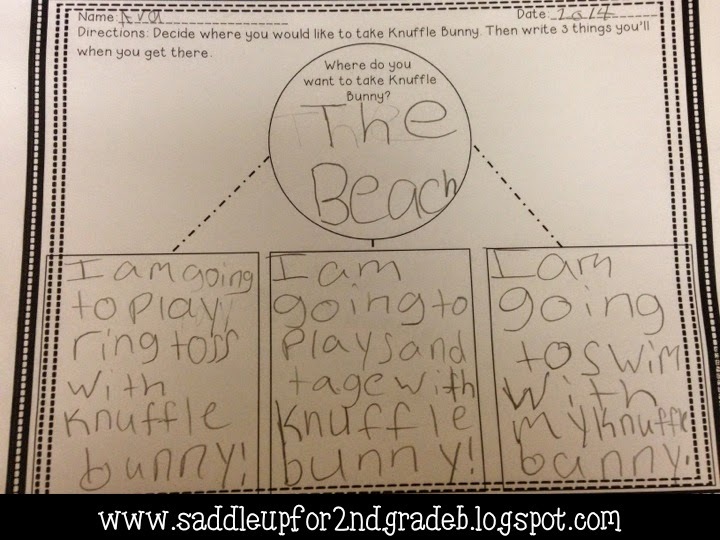 All of the activities we did this week came from my Knuffle Bunny Mini Unit that I’ll be sharing with you at the end of this post. We started out the week reading the first story in the series. 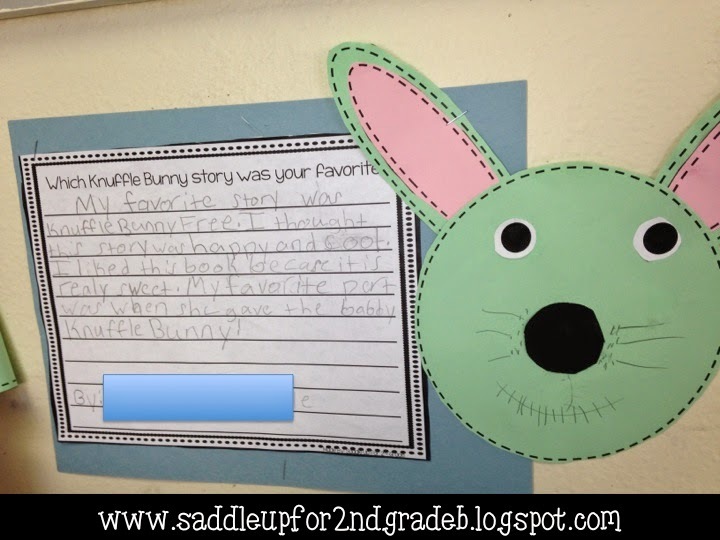 Knuffle Bunny. 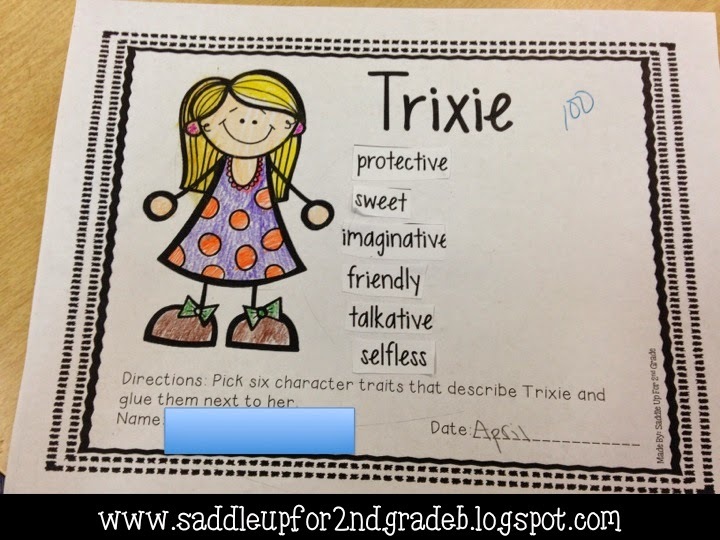 Most of my kids, including my boys fell in love with Trixie from the beginning. I was asked to read the pages where she talks in baby talk more than once. 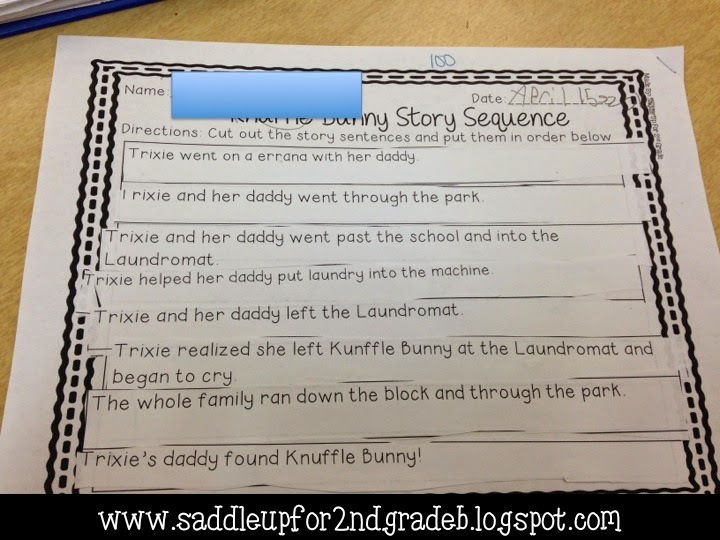 After reading the story we did a quick story sequence activity. Wednesday was my favorite day. 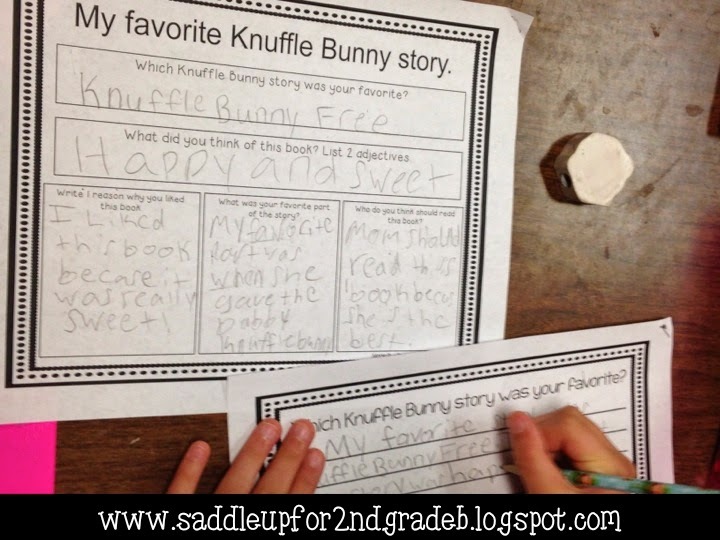 We read Knuffle Bunny Free. This is my favorite story of the series. We watched this youtube video that is a reading of the story. After we really talked about how Trixie had grown as a character from the beginning of the series to the end. 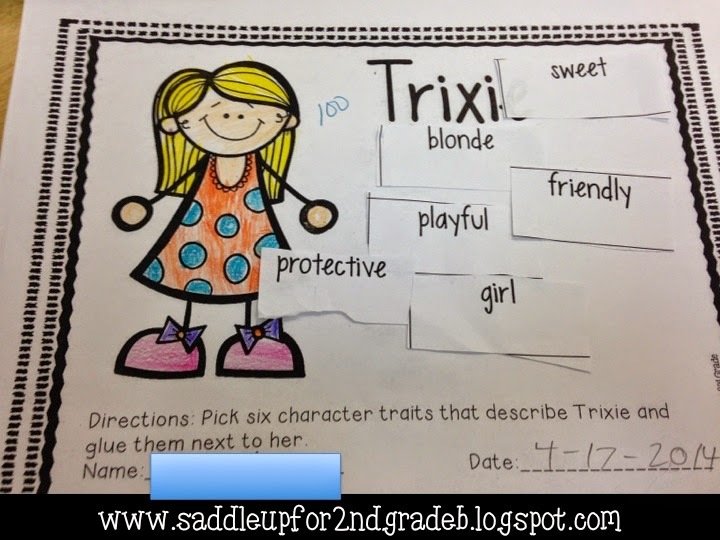 Then we did a quick character trait review. As I mentioned earlier, I really tried to focus on the importance of the illustrations in this series. What we did next was my favorite activity of the week. 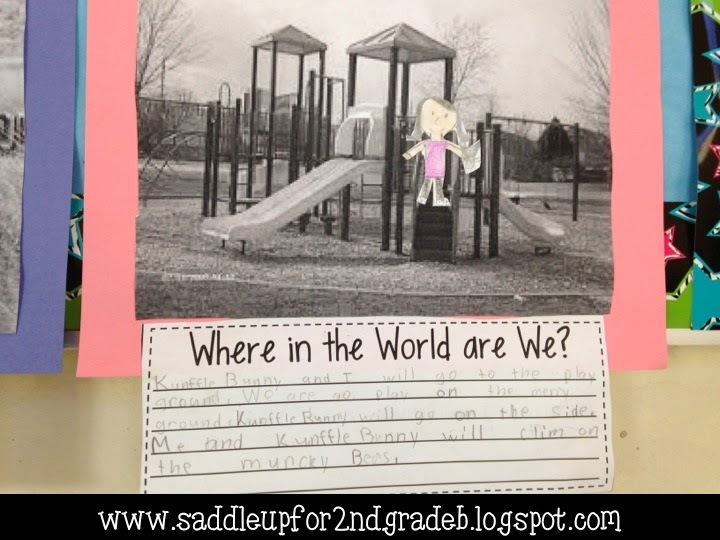 If you have never read the Knuffle Bunny series, Mo Willems uses real life black and white pictures and his characters are cartoon like. I had five black and white illustrations for them to choose from. 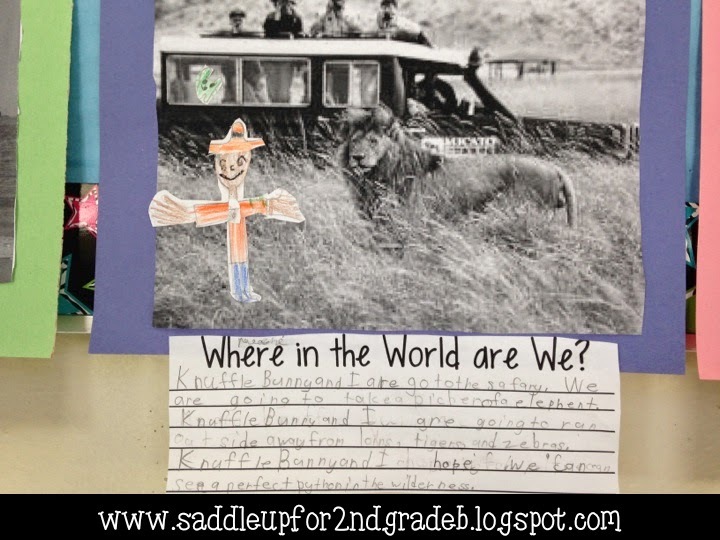 A rodeo, a safari, a playground, the beach, and an airport. 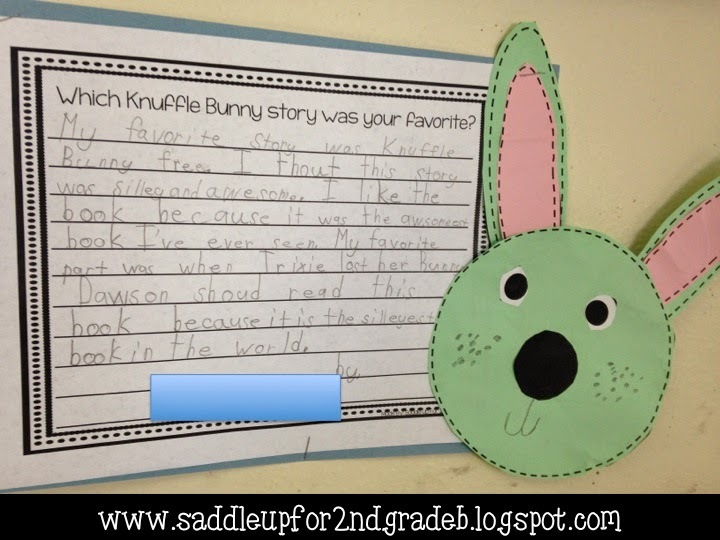 After each child selected their illustration, they drew themselves and their own Knuffle Bunny on scratch paper and cut them out. 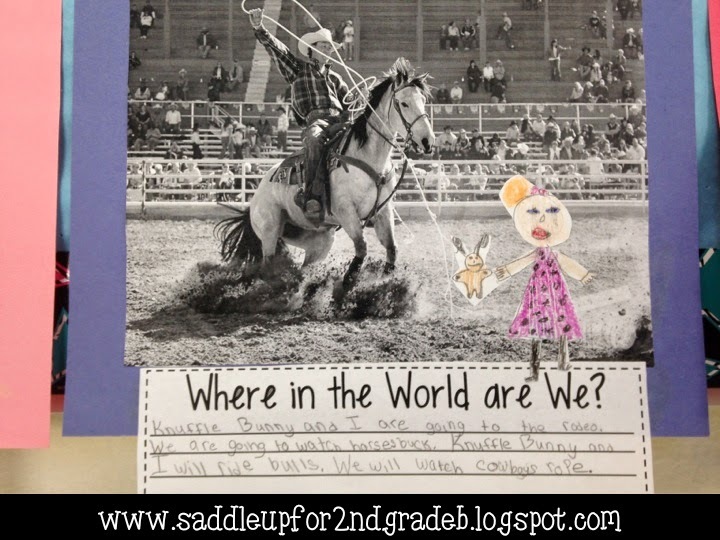 We were going to write all about their illustration they had created but before I turned them out on their own, we completed a writing graphic organizer. Once their organizer was complete, they could started on their final draft. Here are a few of my favorites. I think they all turned out great! 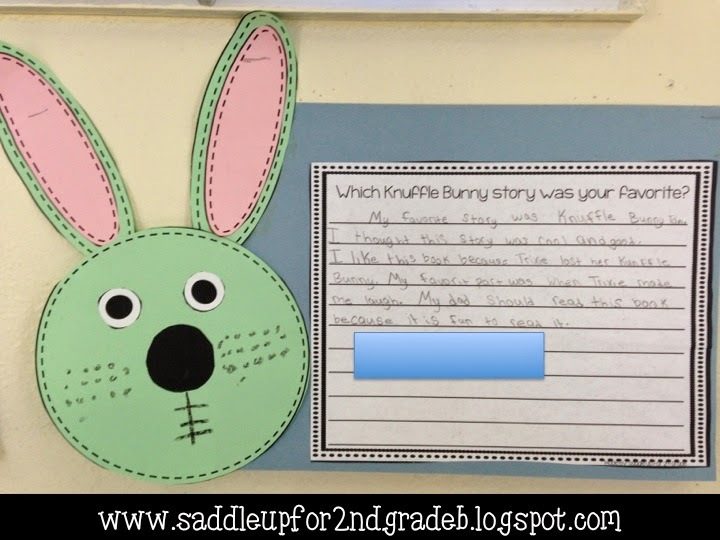 To wrap up our Knuffle Bunny unit, we did a little bit more writing. They were to write about their favorite story from the series. I busted out another graphic organizer. 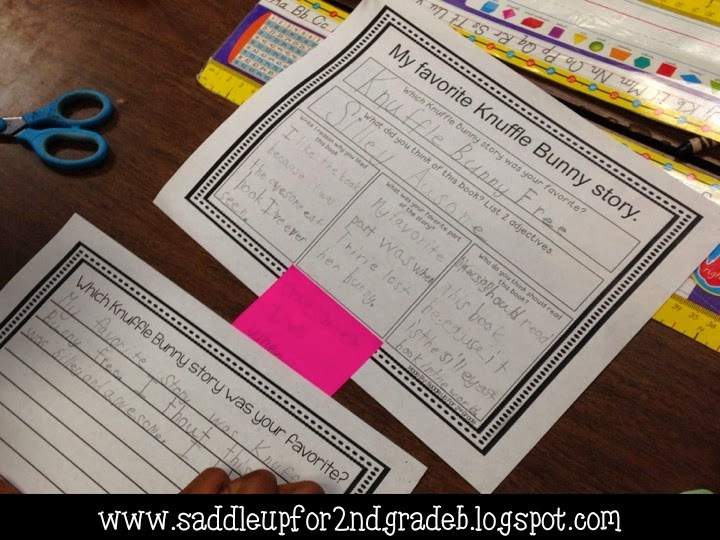 They chose their favorite book, along with two adjectives that they picked to describe the story they chose. They had to tell me why they liked the book, what their favorite part of the story was, and who they would recommend this book to and why. Here are some of our published results. For a group that struggles with writing, I thought they did a really great job. I didn’t have one student complain that it was hard to do which was a first for our writing lessons. 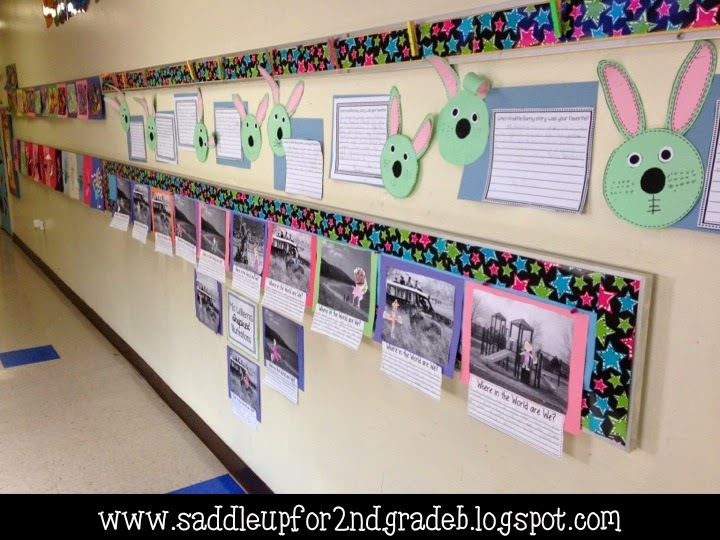 Last but not least, here is a picture of our Knuffle Bunny display in our hallway. 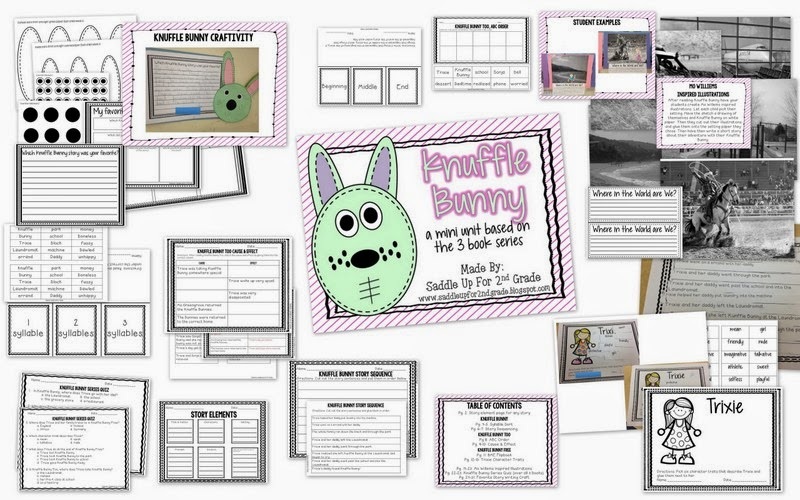 You can get all of these activities we used in my latest Knuffle Bunny unit. 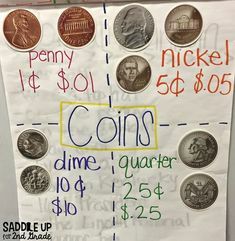 I created this mini unit based on the skills I knew my students needed to work on. Here is a closer look. I hope everyone has a great long, Holiday weekend. I’m off to enjoy the beautiful day outside.